STA.CRUZ, Zambales – It was an ordinary morning of January 19, but something extraordinary was about to happen in Bayto village, Sta. Cruz town in Zambales province. A chilly breeze was blowing, but the handful of villagers from Purok 4 were all heated up as they came out on the road with one thing in mind: to stop the trucks hauling nickel ore from their mountains to the port. At a shed along the national highway, people began to gather, halting trucks laden with nickel ore, while letting other vehicles pass through. As morning turned to noon, more people came out as the trucks piled up, and it became a full-blown barricade against mining trucks. 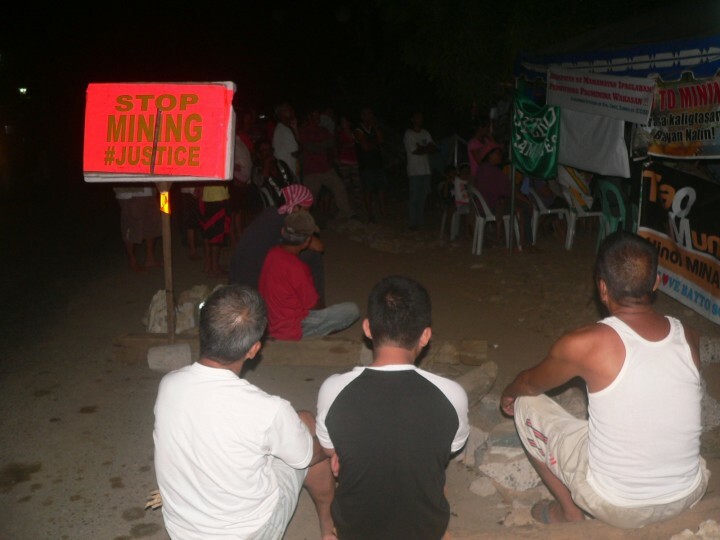 “Stop the mining – that is our demand,” Jose Morello, 66, a Bayto resident told Bulatlat. He said remnant of the red-orange mud from last year’s neck-deep flood is still stuck to the floor of his house. This reminder motivates him to sit with other residents by the road every day, blocking mining trucks. “It’s better to face the trucks, than to stand helplessly by when the waters come rushing in,” said Morello. 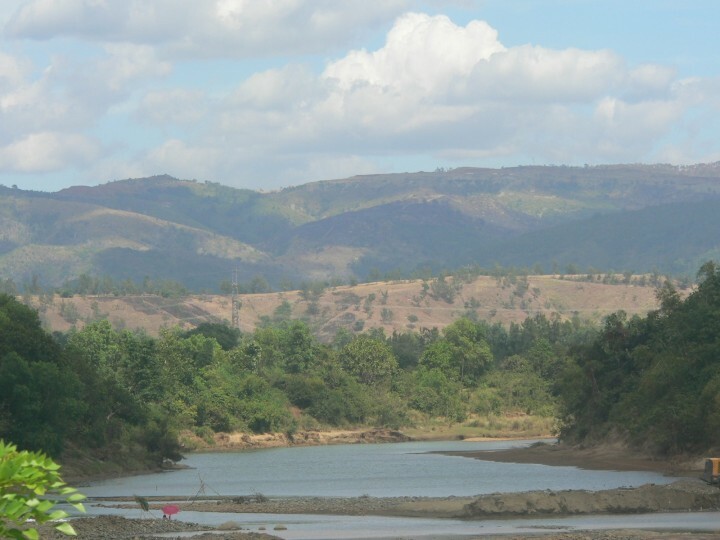 The destructive “red” flood in October last year became a collective, unifying experience, as the affected communities turned their eyes to its source: the mountains, laid barren by 10 years of open-pit mining. As Bayto village stood up against mining, many are inspired to also fight for their lives and the environment. From a handful of residents, the Bayto barricade increased, as they were joined by people from other villages who are also fed up with the adverse effects of the large-scale mining operations. Mining started in Sta. Cruz in 2006. At present, six companies hold a Minerals and Production Sharing Agreement (MPSA), covering 12,000 hectares. Four large-scale mining companies are operating: the DMCI subsidiary, Zambales Diversified Mining Corp. (ZDMC), Filipinas Mining (LAMI), Benguet Nickel Mining Inc., and Eramen Minerals Corp. The companies extract the nickel ore and transport them in trucks to a loading bay in Sta. Cruz. People blame the open-pit mining by these companies, when the rains brought by Typhoon Lando (Koppu) on Oct. 17, 2015, brought mud and dead wood, overflowed the rivers and destroyed homes and farms. The flood left seven people dead and 14,000 Sta. Cruz residents affected. The companies have denied responsibility for the flooding. Ruth-Ann Elauria, 17, recalled that the water was rushing knee-deep as she, her mother and two younger siblings went out of their house at 10 p.m. during the typhoon. Their house was high up near the river, which by then had overflowed to a deadly level. As they made their way in the darkness, the storm howled, and stones rolled under their feet in the strong current. 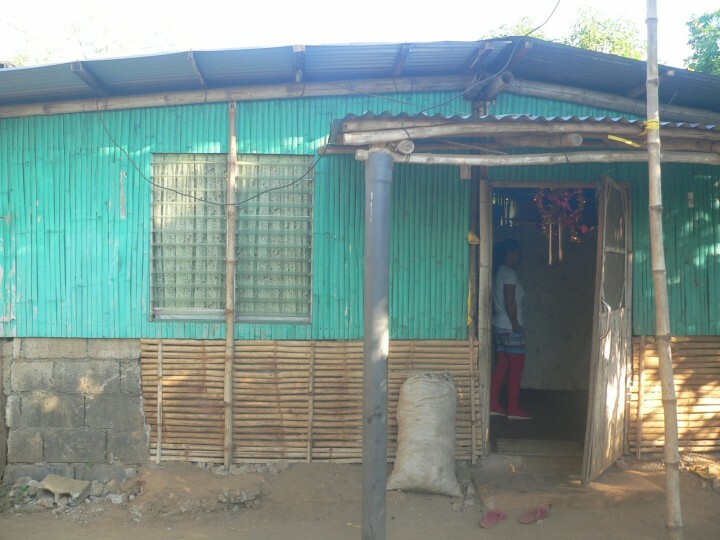 “I thought, ‘Will I still be able to return here?’” Ruth-Ann told Bulatlat. She recalled shivering in fear and cold, as they spent the night drenched in their clothes in a hut in the hills. As the flood subsided the next day, her mother Annabel went back to find their house still standing, but everything else was laid waste. “I was shocked when I saw our house. I didn’t know what to do,” said Annabel, 41. Two gaping holes run through and through the sides of the house where the water crashed. Furniture, appliances and household items were all jumbled up to one side. Knee-deep mud covered the floor, where all their clothes were buried, no longer usable. So were all their electronic appliances, except for the TV and one electric fan. The children’s books and school materials were all ruined. “’I wasn’t able to save anything,’” Annabel recalled telling her husband Ronaldo, who works abroad. “It’s okay,” he assured her, grateful that everyone was safe. She said she always prepares emergency packs for her family whenever there is a typhoon, except for that time when Lando came. She was at least able to save their IDs and important documents. Soon, Ruth-Ann’s classmates were texting her, offering to help clean up their house. Some neighbours volunteered to wash clothes. They shared whatever food they had, until government relief aid came. But they did not receive any assistance from the mining companies. Just as how they helped each other out during the time of disaster, Bayto residents received much needed sympathy and support. Lyn Layno, 67, Bayto resident and pastor of the Assembly of God, said she automatically joined her neighbors in the barricade, and gave whatever support she can. “The people’s humanity came out…people showed kindness and support for each other,” she told Bulatlat. She said since the barricade, she got to know many village mates whom she never had a chance to meet before. One of the biggest supporters was the Catholic church, led by Fr. Noel Montes of St. Michael’s Parish in Sta. Cruz. “This is the new Balintawak,” the priest called the Bayto villagers’ stand, in reference to Filipino revolutionaries who tore up their cedulas in the Cry of Balintawak, which signalled the 1896 Philippine Revolution against Spanish colonizers. As the barricade impeded the mining trucks, it opened the floodgates of kinship and community spirit among many who are fed up with the effects of the mining. In the afternoon of Feb.6, the trucks did not come alone: they were escorted by more than a hundred policemen – toting Armalite rifles — from Sta. Cruz and Candelaria towns. After two weeks of the barricade, 25 trucks had lined up on the side of the road. Traffic piled up to several kilometers when the road was closed off to all vehicles, as the villagers defended the barricade. Police pushed against the people as the trucks inched their way through. Police then started grabbing the men, handcuffing them and loading them into the police open van. The women linked arms to keep the blockade, and the police reportedly pushed against them, and grabbed at their breasts. A 38-year-old housewife who requested to only be called “Layla,” said she saw the police grabbing the women’s breasts, so she turned her back to them, and was then hit hard at the back by an Armalite barrel. She said she incurred abrasions in her back, while many women had bruises on their chests. Police ran after a resident, Jerome Merano, 34, who tried to resist the handcuffs. Two policemen pushed his face against a trash bin, and punched him. By this time, hundreds of residents have come out, summoned by the clanging of the batingting, a make-do “bell” made of an old truck wheel and metal hammer. Many even blocked their vehicles on the road. They helped those who had been handcuffed and took them out of the police vehicle, including Merano. They continued to block the road in spite of threats by the armed police. After three hours, the police retreated so the road can be opened to other vehicles. A female resident was arrested. The people were enraged to see the police escorting the mining trucks, instead of taking the side of the people. But not all policemen were aggressive, as some were also victims of the red flood. The same scene was repeated the next day, Feb. 7, only this time the police carried batons and shields. Police retreated but had arrested another resident. 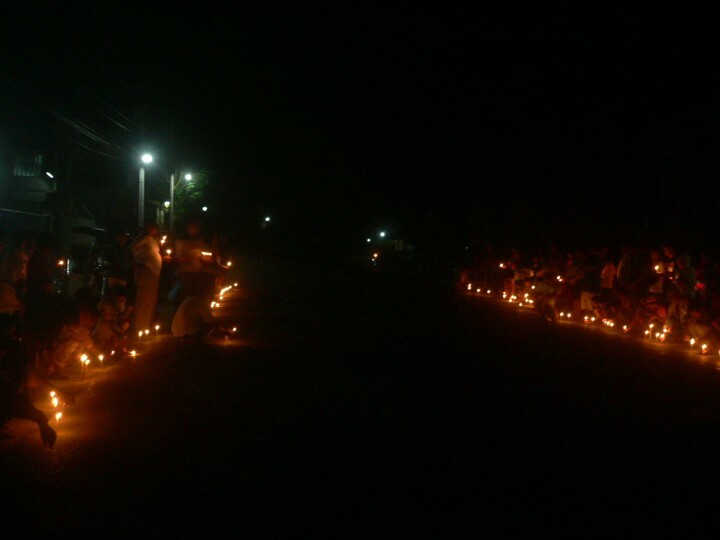 On the third day, villagers scattered large rocks on the road. Police again tried to push against the human barricade to clear the way for the mining trucks, but still to no avail. Eventually, the police lost steam and gave up. The two arrested residents were eventually released after brief detention. “Panalo kami,” (We won) Morello recalled. The people rejoiced. “The police said it was just ‘their job.’ But for us, we’re fighting for our lives,” said Layla. The Bayto barricade may have impeded the hauling trucks servicing the mining companies, which are forced to take the circuitous and more costly route to the port, yet the extraction continues. 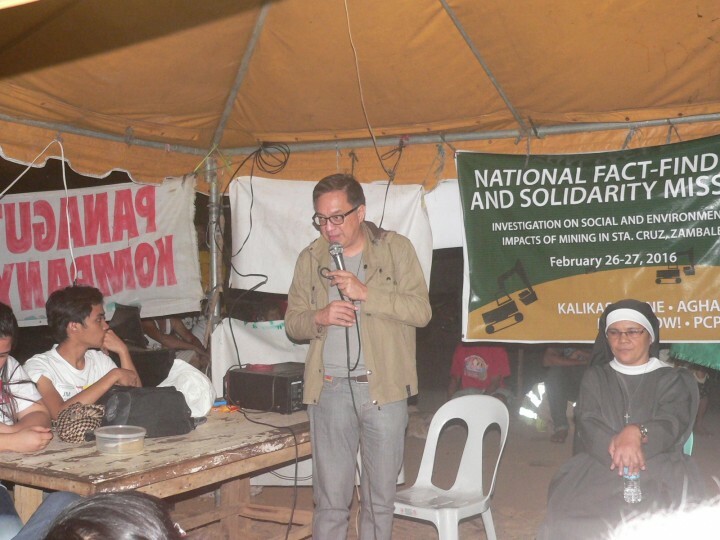 In a forum on Feb. 27 during the National Fact-finding and Solidarity Mission led by and Move Now!-Zambales, Clemente Bautista, national coordinator of Kalikasan People’s Network for the Environment, lamented that the October 2015 flooding in Sta. Cruz was not considered a mining disaster. Bautista called on anti-mining residents of Sta. Cruz to elevate their calls to scrapping the Mining Act of 1995. “We oppose not only the operations, but the policies and the law. We can stop one mining company, but another will just replace it, as long as the law exists,” he said. The call to scrap the Mining Act is supported by the Sta. Cruz church and Fr. Montes. “It’s better to die fighting than to die helpless without a fighting chance,” said Benny Cayanan, church worker of St. Michael Parish and Bayto resident. He said this became the axiom for the villagers, as they made a stand against mining and faced the risks that go with it. On Feb. 9, policemen charged seven people with obstruction of traffic, public disorder and illegal assemblies and association. Only two of those charged were Bayto residents and had actually been in the barricade. Cayanan said they were optimistic that the complaint will not prosper. Amid the flow of support, Cayanan calls on those who would like to give material or financial aid to Bayto to course their support through the St. Michael’s Parish church. He lamented that some opportunist groups had been soliciting cash from abroad through social media, but none of such support had reached Bayto. Many Sta. Cruz residents are still afraid to openly oppose the mining companies, but the disasters that are getting worse every typhoon season are slowly giving them courage to take control of their fate.